The SQ Series pressure switch is available in a wide variety of configurations. 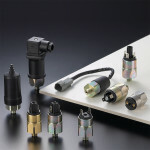 The SQ pressure switch utilizes an internal diaphragm which is subjected to the process pressure through a connection in the application. A variety of fixed or adjustable ranges, and electrical connections, are available. SP Series is a thermal dispersion flow switch is a precise flow sensing device for liquids. The principle of operation is based on heat transfer. The SP thermal dispersion flow switch is offered with a variety of output types and materials of construction. No moving parts make the SP series a long lasting and high value flow switch. 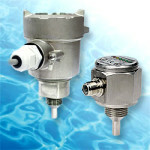 SF Series is a paddle flow switch for use with a wide variety of fluids. The paddle flow switch uses the force of the liquid flow to actuate a reed switch. It can be activated by as little as 5gpm (19.4l/m) flow. MMS Series is a materials management system product line including two software packages designed to run on most all PC’s. This includes the MMS-TL tank level inventory materials management system and the MMS-TLA grain temperature monitoring system. The EST Series is a grain storage temperature and level monitoring system consisting of the EST110 and EST120 sensors and MMS-TLA PC-software. The EST110 sensor cable is for temperature sensing only, the EST120 is for temperature/level monitoring from a single cable. 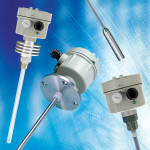 Simplified installation and start-up using 1-wire digital temperature sensors. More cost-effective than thermocouple based systems. Wireless or hardwired. NOW AVAILABLE FOR LIQUID AND GRANULAR MATERIAL MEASUREMENT! 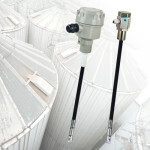 The JFR Series is a open-air radar level transmitter designed for measuring the changing level of liquids, slurries and bulk solids in tanks, bins and silos. 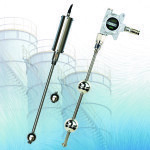 Operating at 26GHz the JRF series radar level transmitter products will provide non-contact continuous level measurement with high accuracy and reliability. 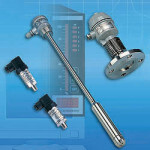 The EG Series is a magnetostrictive level transmitter used to accurately measure the changing level of liquids. 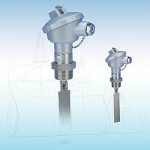 The EG magnetostrictive level transmitter uses the principles of buoyancy and magnetostriction. Single and two-float designs are available. EC Series is a hydrostatic pressure level transmitter product line that uses piezoresistive technology and a Wheatstone bridge electrical circuit to measure the level of a fluid in a vessel and provide a variable analog output. The EB5 Series is an RF admittance level transmitter that continuously measures the changing level of a powder, granular or liquid material within a containment vessel. The RF admittance level transmitter measures the changing capacitance between the sensing probe and the reference ground (reference probe or metal wall of the vessel) to determine the level of the material in the vessel. The EA Series ultrasonic level transmitter is a non-contact and easy-to-install level measuring device used for measuring the changing level or height of a liquid within an enclosed environment such as a tank, with little to no maintenance required.